A company bottling and distributing soda for PepsiCo in Mexico, Grupo Gepp, has closed its plant in the city of Ciudad Altamirano citing gang threats. 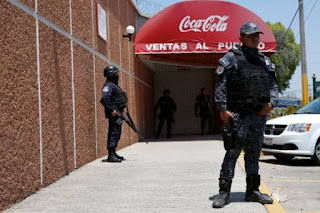 The move comes less than three months after Pepsi's rival Coca-Cola Femsa also closed its plant there. Workers said they had been threatened by organised crime gangs who demanded "protection money". Earlier this year, the US state department warned against travel to the region because of gang violence.